I decided to mix up the colours with prints. A striped knit dress from Zara and a cotton houndstooth scarf from Simon’s was my comfort zone. I got a lot of compliments from the ladies in the office on my red Hue tights. I forgot how much fun coloured tights can be and I plan to rock more of them for the next few months. (Summer please come!) As for the rest of my outfit: headband from H&M, sunglasses by Ray-Ban, coat from Club Monaco (also seen here) and shoes from Zara. There was much anticipation for the MASSIVE, DEBILITATING, CITY-STOPPING snow storm that hit southern Ontario yesterday. Julie and I rated this “storm” a 4 and our comments were left to, “meh”. Never trust the weather man/woman. To say the least, I was prepared in my Canada Goose Expedition parka, Cougar waterproof snow boots, cashmere toque and Ray-Ban wayfarers. There are a number of people (stuck up Fashionistas) who love to hate on the Canada Goose parka which is understandable, as they now dominate the Toronto outerwear market with 1 out of 5 (SDP observation) people wearing them who pass by. It is easy to reject or vocally denounce the mainstream but, the point of the matter is that when it comes to Canada Goose, they are the warmest, most functional jackets you can buy. Canada Goose may not be run-way fashion but rather really, really warm – more of a forcefield to the sub zero temperatures that Canadian winters bring. Also, when you look at the inside tag it will read, ‘Made in Canada’. How many items in your wardrobe will read that nowadays? 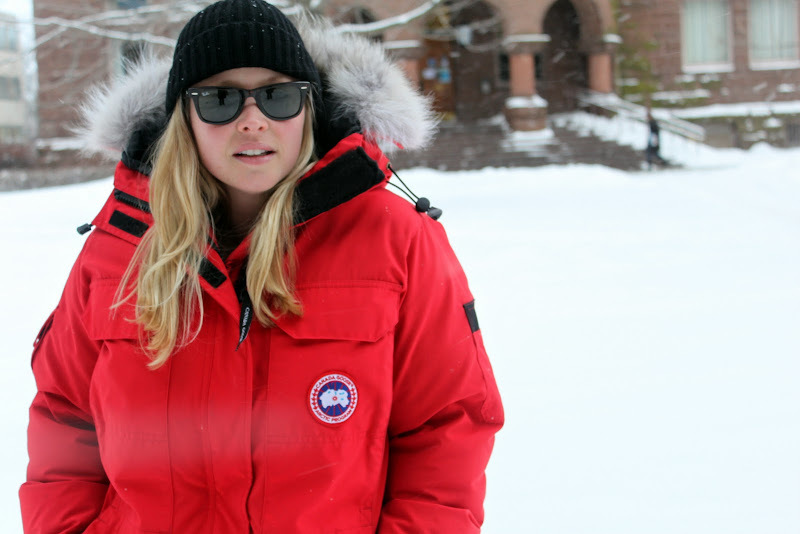 Canada Goose is an international success – and I love my Canada Goose parka. I’ve been waiting to wear these heart printed Betsey Johnson tights for some time now. 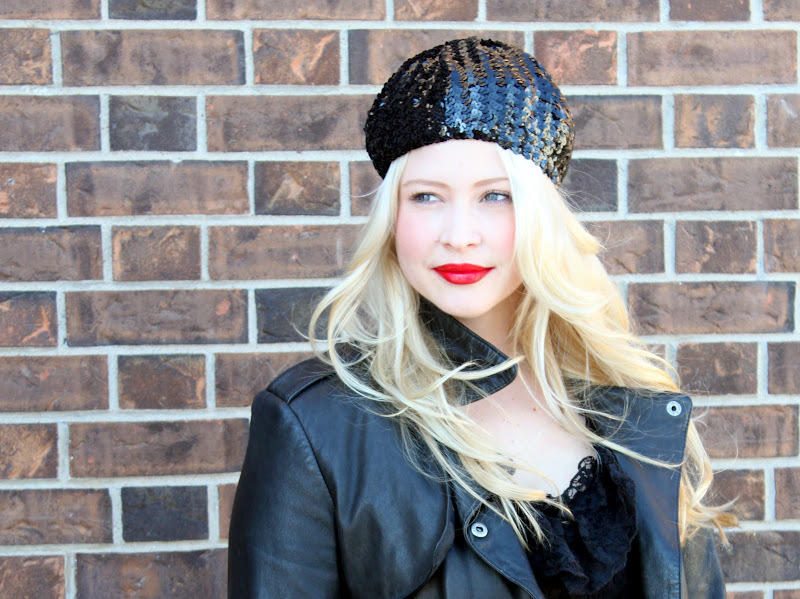 They have been paired with possibly my best thrifted find of 2010 – a $12 Topshop dress from VV Boutique, a Club Monaco leather jacket, sequined (SEQUINS!) beanie from Zara and shoes from Aldo. Oh, and I can’t forget about my lipstick, it is Tom Ford’s Cherry Lush.